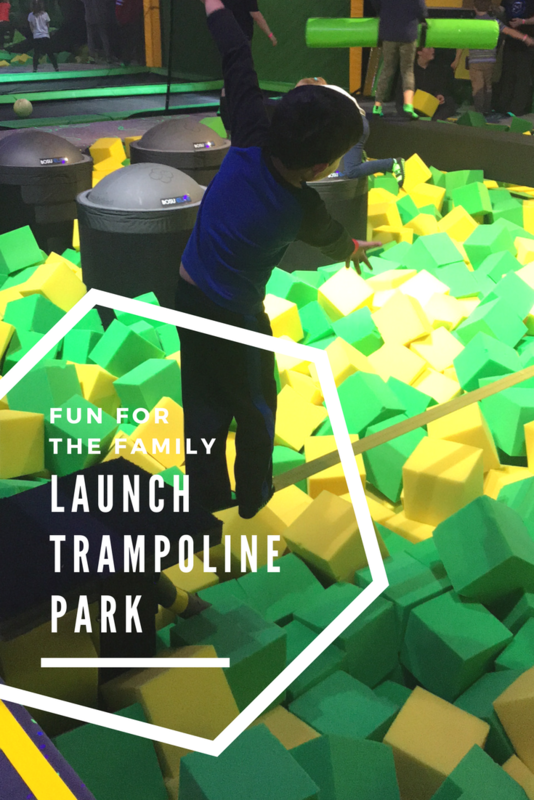 Launch Trampoline Park provided my family and I jump passes, laser tag tickets and jump socks to check out and enjoy their attractions. All opinions are my own. 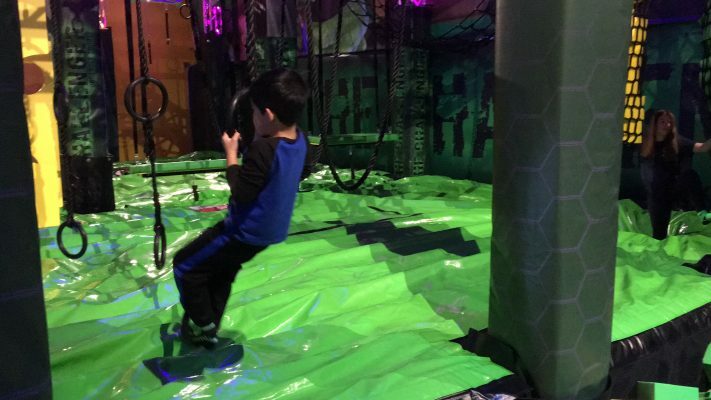 As a mom of four, I’m always looking for fun, indoor attractions for my family. It’s especially great to find a place that works for all of us, parents included! Launch Trampoline Park just re-opened in Warwick, Rhode Island and it’s a place you could spend hours of endless fun. After our time there, my kids were so wiped they slept the entire way home! The Main Court is equipped with individual trampolines that are attached in a grid design. It’s a great place to shake your sillies out and try out some fancy tricks. Don’t be fooled, though, that’s not all there is to do. Dodgeball – Playing Dodgeball on a bunch of trampolines seems like such a fun way to experience the game. I imagine a lot of teenagers enjoy this! The Launch Arcade – This is a great way to hit the pause button if your family is getting tired. 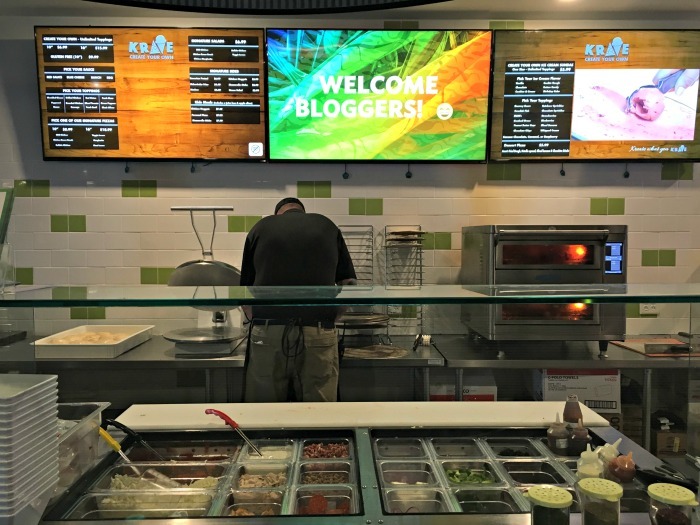 KRAVE Create Your Own – If you’re “kraving” something to eat, KRAVE will make your pizza just how you like it! Choose your toppings and have your pizza, or salad made right before your eyes. Cliffhanger – My 5-year-old gave it his best shot to try to climb an indoor mountain rock wall. I think his favorite part was falling off! Laser Tag – “Get ready to fight in the ultimate Galactic battle for the fate of the Galaxy.” This was my first time playing laser tag, and oh my gosh, was it fun. The boys loved the whole experience. 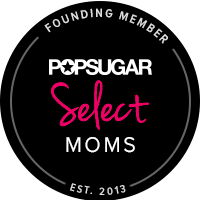 If you want to visit Launch with your family, use code: modmommy10 for a 10% discount for online purchases at Launchri.com. The code is good until May 1! Tell me, what activity would you and your family head to first when visiting Launch?